When Google Plus opened to all, people were excited about the platform because if was from Google. In just two weeks the new social network had reached 10 million users and the G+ iPhone app became the most popular in the iTunes store. However, when you actually got in and began to create and share content, it felt much like Facebook. Other than the fact that it was from Google and was optimized for sharing across the Google walled garden, people didn’t feel a compelling reason to use it. New social networks that achieve massive success always offer something a little different from what’s already out there. Instagram began by offering a great platform for sharing photos. Snapchat initially had a clever disappearing message service and then began offering a “stories” function. 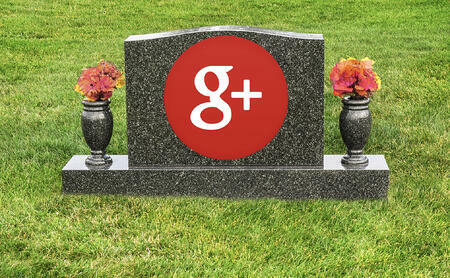 However, Google Plus was doomed because there wasn’t anything new and compelling. The problem with social networks is they come and they go. You simply cannot rely on the companies behind social networks to be there forever. And you can’t trust those companies that will be active in the long haul (Facebook comes to mind) to display your content in the years to come in the way you originally intended. Always remember, the social network owns your content, not you! Several years ago, the Vine social network also closed up shop. I used Vine a number of times and found it to be a fun way to share 6-second videos. Many people invested way more time than me, sometimes hundreds of hours creating and curating a social presence on Vine. All that was lost in an instant. Now all your content on G+ will disappear. You can go in and download your content. Here’s how. All the social networks provide ways to connect with people and to create content. That’s great. But when you do, always remember that people are going to your content on those social networks’ real estate. You don’t own that. The social network controls the look and feel, the ads shown, and the people there. And they can change the way your content is displayed or like Google Plus, shut down the network completely. The solution is to publish your best work on your own site. You own it, search traffic comes to you, and it lives forever.